The Minnesota Public Utilities Commission (PUC) is scheduled to vote on the Enbridge Line 3 environmental impact statement (EIS) Thursday, Dec. 7, starting at 9:30 a.m. at its regular meeting space in Metro Square, 121 7th Place East, Suite 350, St. Paul. The public will not have an opportunity to speak, but public presence sends a message to the PUC that people are watching. To recap: Enbridge’s existing Line 3 is old and failing; Enbridge wants to abandon it in the ground. (Bad idea.) It has proposed a new and larger pipeline along a new route through northern Minnesota. It threatens the Mississippi headwaters, lakes, rivers and wild rice areas. It violates the interests of Ojibwe people who have reserved treaty rights to hunt, fish and gather along lands crossed by the pipeline. The EIS decision is one of several key Line 3 votes. Should the PUC find the EIS “inadequate” it would not kill the project, but would likely delay it. The EIS would need further work. (A project delay would also cost Enbridge money.) Even if the PUC approves the EIS, the PUC still needs to vote on Line 3’s Certificate of Need and Route Plan. Those votes are not expected until April. The EIS has been criticized by indigenous and environmental groups. The Minnesota Chippewa Tribe, in cooperation with six Chippewa bands and Honor the Earth, has released its own draft environmental impact statement, called the Tribal Cumulative Impact Statement. 1. Should the Commission find that the Final Environmental Impact Statement is Adequate? 2. Should the Commission adopt the administrative law judge’s Findings of Fact, Conclusions of Law, and Recommendation? 3. 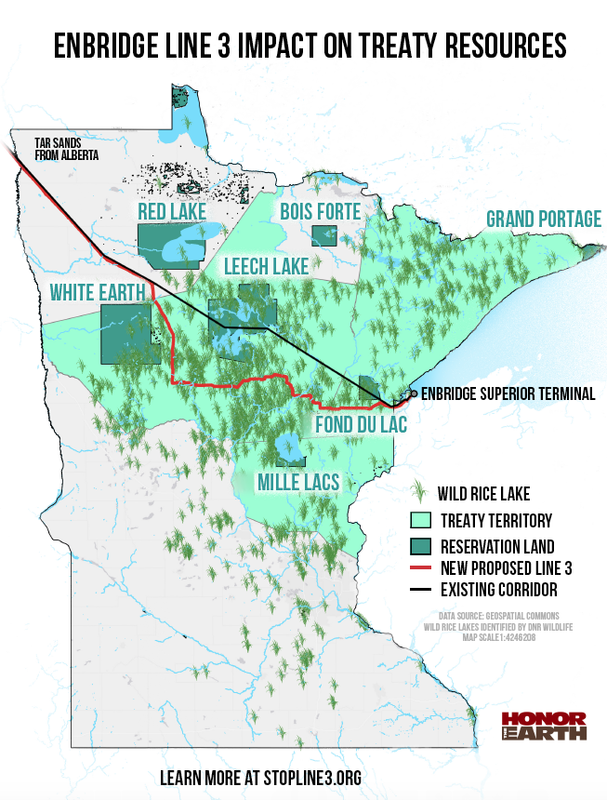 Whether the data identified as Trade Secret in Appendix F and Appendix I of Enbridge Energy, Limited Partnership’s Certificate of Need Application for the Proposed Line 3 Replacement Project is public under the Minnesota Government Data Practices Act. After 500 years of genocide and colonialization, Anishinaabeg Akiing (and the Anishinaabeg people) has been degraded. Most of these impacts have been from the relentless march of industrialization across Turtle Island. Now, Anishinaabeg Akiing (and the Anishinaabeg people) face another industrial expansion. This push takes the form of pipeline and mining projects. The system that both of these projects represent is deeply broken and threatens the very survival of human culture. Anishinaabeg (and other Indigenous Peoples) must be the ones to lead a global change in direction. This is because Anishinaabeg) (and other Indigenous Peoples) share similar covenants with nature that emphasizes community, respect, and living in balance. Here is the Sierra Club’s critique of the EIS.